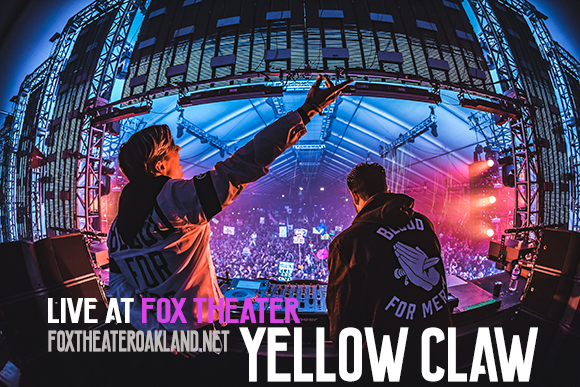 Fans listen up, it's that time you've all been waiting for as Yellow Claw comes to Fox Theater Oakland! Here's your chance to catch it all live, just grab a ticket and come down on Wednesday 20th September 2017! It's about to kick off as the electronic chart topping hit makers are embarking on a journey… this Fall – don't miss out! Put in the top ten Dance Artists that you should know, is the two words on everybody's lips right now – Yellow Claw! This EDM duo aren't like others on the genre scene, they are the exceptional standard, with their spot on production and link ups with the very best vocalists there are, Yellow Claw are breaking the barriers and providing fans with an unstoppable sound to get involved with! LIVE they will have the crowd bouncing, stomping, jumping and getting down low to the infectious beats and hard hitting bass lines! Get ready to catch them this coming Fall! "There was a moment at EDC Vegas last year when Bizzey made a 40-feet front-flip stage dive and my heart stopped beating," says Nizzle. "Jim and I looked at each other like, 'Did he make it?' After a few seconds of just darkness in the crowd, he came up with the mic in his hand and the adrenaline hit all three of us to go even harder."